Model of the year Bella Hadid is absolutely chic and fashion forward as she stars in the Fendi Spring/Summer 2017 Campaign. The brunette model, who welcomed the new year with a sheer lingerie baring dress, is photographed by the acclaimed Karl Lagerfeld for the images, and is a true Parisian babe. 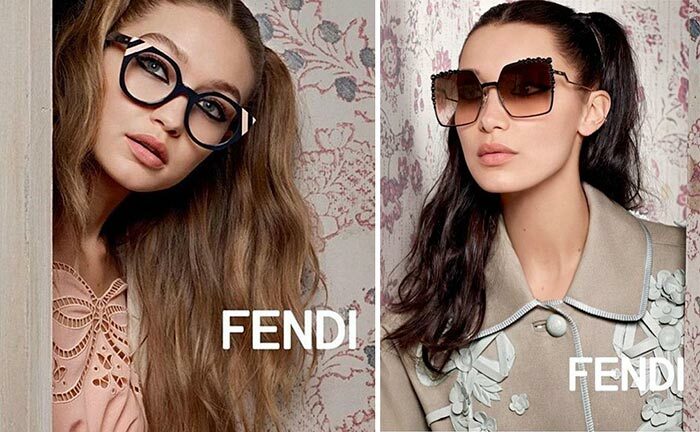 Bella as a spokesperson for Fendi is admirable, and ravishes in a floral brocade dress styled with oversized chocolate brown sunglasses along with a chic Fendi handbag. For another image Bella is seen in a high-waist ankle-length skirt styled with a cropped top, and her hair styled into pigtails. Bella, who has taken the fashion world by storm, is gorgeous for the campaign, and is sensational in the feminine silhouettes presented by Fendi for the upcoming season. Her elder sister Gigi Hadid also make an appearance in the campaign, sporting a pastel pink top and a stylish pair of shades and her hair in pigtails.